Young ladies are not growing up in the same world as their parents did! The Xtreme Divas 360 Women’s Self-defense program lends its training to cover young ladies between the ages of 11-14. Ladies of this age group are entering into a very difficult transition period where life stressors, social acceptability and self-understanding make it difficult to see challenges clearly. Some of those challenges may have life changing consequences, especially when personal protection skills are lacking. That’s where the JUNIOR DIVA DEFENSE class kicks in to increase confidence, awareness and ability. The Junior Diva program is based from the Xtreme Divas curriculum. The materials presented in this course are deliberate and effective against an attack. Strikes to areas outlined in this program could cause severe injury or worse to the attacker (s). The emphasis is placed on never needing to deploy strikes but implement escape and evasion measures to distance oneself from confrontation and potential hostilities. Time is spent on identifying truly hostile targets while dismissing emotional based responses to social stimulates that could result in inappropriate actions. We help our young ladies fight smarter not harder. Flight not fight is a key but; measures are implemented when there is not a clear escape route. It doesn’t matter your size or physical condition, these methods will make you safer and more confident. Young men are not growing up in the same world as their parents did! What once was a simple fistfight is now often a sever beat down where permanent injury and possible death occur. With the increase in violent behavior and severity of injuries reserved, new measures of self-defense need be applied. That’s where the JUNIOR MALE DEFENSE class kicks in to increase confidence, awareness and ability. 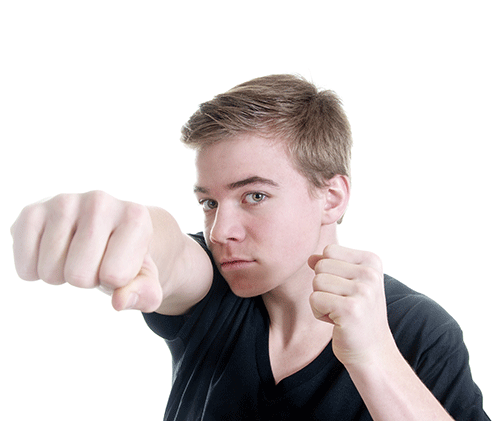 The JUNIOR MALE program is based from the Ultimate Men’s Defensive Tactics Class. The materials presented in this course are deliberate and effective against an attack. Strikes to areas outlined in this program could cause severe injury or worse to the attacker (s). The emphasis is placed on never needing to deploy strikes but, implement escape and evade measures to distance oneself from confrontation and potential hostilities. Time is spent on identifying truly hostel targets while dismissing emotional based responses to social stimulates that could result in inappropriate actions. Upon completion of this class, students will be able to identify and apply safety principles for firearms. Special attention to safety protocol and procedures will set rules for proper firearm handling in sports/hunting events. Students will be able to safely and effectively fix weapons malfunction, clean and store their guns while following safety guidelines in the home, on the range and in the field. This class has a physical participation element where students accompany instructors in live fire practicums. On the range safety guidelines are reinforced through applications and repetitions. Parents can have confidence when dropping their student off that they are with trained instructors in a safe environment. Size appropriate firearms will be used in the classroom and on the range. Our preferred handgun for training purposes is the Ruger SR22. The gun and 50 rounds of ammunition will be provided for each student along with eye and ear protection. We help our young men fight smarter not harder. Flight not fight is a key but; measures are implemented when there is not a clear escape route. It doesn’t matter your size or physical condition, these methods will make you safer and more confident. As confidence in one’s ability grows, the need to prove one’s self in a physical altercation is diminished. Controlling yourself is the first step in controlling others.